The children also enjoyed a visit from a storyteller who mesmerised the children with his stories and music. We had 3 visitors from Ramsey who came and read us their favourite childhood stories. The children enjoyed lounging with a book in the sensory garden and even played a game of story Cluedo. The children had a huge surprise on Thursday when the famous author 'Mini Grey' visited school (the author of Biscuit Bear). She read us a new story that was only released that same day! What lucky Caterpillars we are! Caterpillars have been having an amazing Summer term. 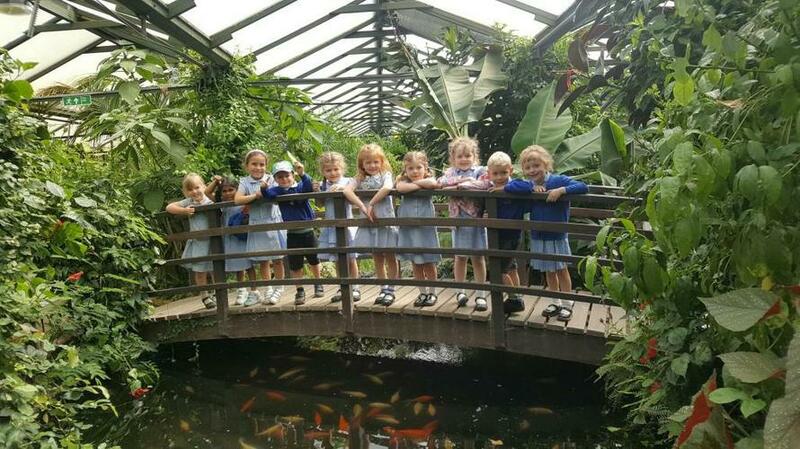 We have been on a great trip to Tropical Wings which has led us to start thinking about us Caterpillars becoming Butterflies and moving onto year 1. Welcome back! We hope you all enjoyed the Easter holidays. We've got off to a great start. 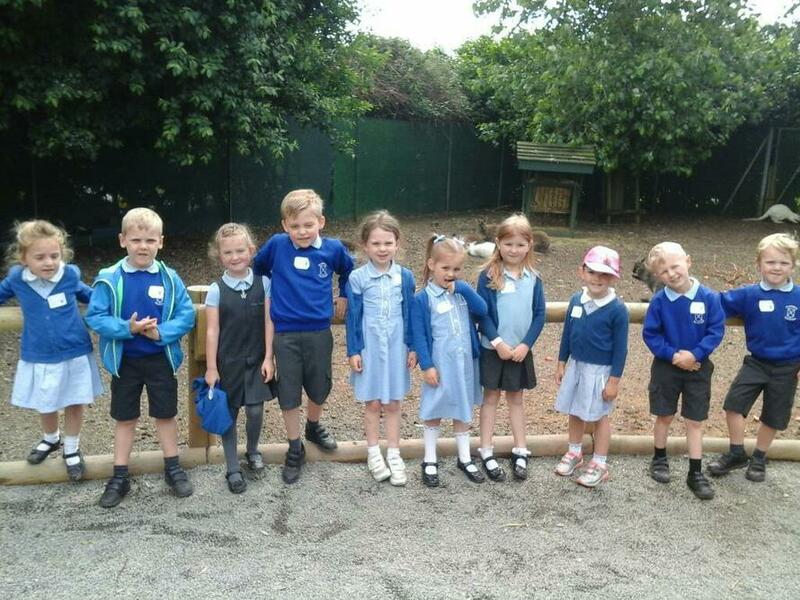 The chicks and the duckling have had a lovely time at Mrs Fitzgibbon's house over the holidays and have grown lots! 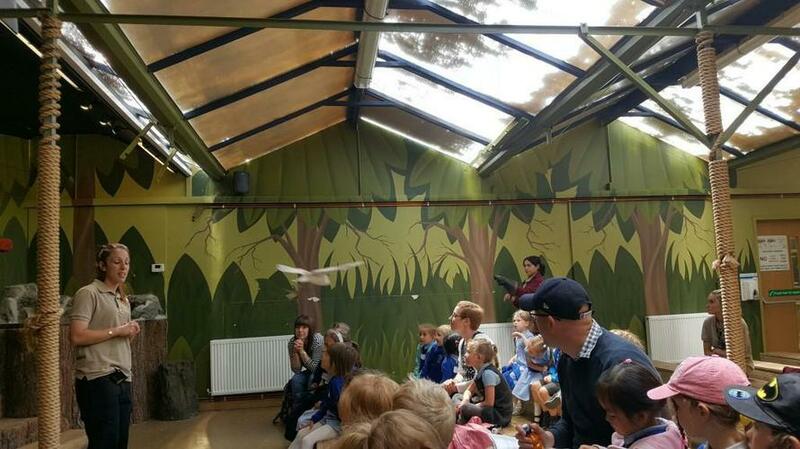 They are now back in the classroom and the children are having a wonderful time handling and looking after them. In addition to learning about looking after animals the children will be learning about plants too. We are hoping to do some planting in the tyres and raised beds in the Early Years outdoor area this term. We will paint each of the four tyres in house colours and split the children into house teams to look after a tyre each. If you have any leftover paint after decorating in blue, red, green or yellow we'd be grateful for any donations, thank you! On Thursday 30th March at 1.30pm the Caterpillars will be selling photos they have taken of children in school. The photos will be available to view on laptops. If you would like to buy a photo of your child/children an order will need to be made. The photos will then be printed on photo paper and (depending on how many orders we get!) be given to the children at the end of the day on Friday. Please come and see us we have sibling photos and photos of children from all year groups. The children in Caterpillars Class have settled in well. They are getting to know each other, making friends and adapting to school and class routines beautifully. The children have been busy learning about themselves, their feelings, how they move and how to stay healthy. They enjoyed setting up a doctors surgery role play area this week and they have been busy taking telephone messages, recording symptoms and writing prescriptions! Our curious Caterpillars asked lots of questions when Mr Argent and Mrs Denny came to visit and talk about when they went to primary school. Did you have laptops? Did you have a sandpit and a slide? Did you have snacks and drinks? Did you do writing? We compared primary school in the 1940s and 1950s to the Caterpillars' experiences over the last few weeks. 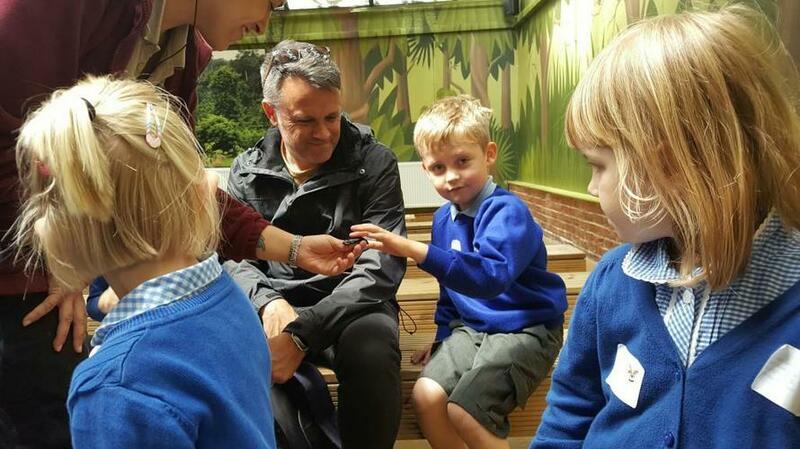 Mr Argent and Mrs Denny commented on how polite and welcoming our Caterpillars were, and how beautifully they listened and asked questions. Well done Caterpillars! It's been a superhero kind of week! My goodness, what a fun week the Caterpillars have had so far! The children came in on Monday morning to find that Ken was tied to the train tracks and Aerial was suspended from the ceiling! They got straight to work, freeing their toys and thinking about who could have done this and why. They looked for clues and made suggestions all morning. They eventually decided that it was Bad Batman. He had come to our classroom in the middle of the night through a portal inside our reading bat cave. He wanted to get rid of all our toys! Some children made wanted posters and put them up around school to help to find the villain. They also found some of his phones outside and recorded some of the numbers that they thought were left as clues. Perhaps together they might make a phone number that would lead us to Bad Batman! Our superhero dress up day was a huge success. We read 'How to be a Superhero'. The children worked together to create superhero names for themselves and talked about what their special powers were, Some children made superhero cookies and thought about what foods a superhero might need to stay strong. The general consensus was that a superhero needs fruits and vegetables to stay strong "because they are good for you!" Various suggestions were offered, such as mangoes, kiwis, bananas, apples, oranges, carrots, peas and broccoli! Other children made superhero dens or raced like heroes and made obstacle courses to help stay fit, healthy and powerful. Your efforts have astounded us this week Caterpillars, and your enthusiasm is infectious. Keep enjoying your learning. The sky's the limit! 25.01.17 - This week has 'bean' so much fun! The children in Caterpillars class have been planting beans. See below for photos and updates of our class bean diary! We've also been reading Jack and the Beanstalk. At the end of this week the children will be making a story map and learning the story by heart with actions. We have all, been so proud of their enthusiam and determination this week. Well done to each and every Caterpillar!